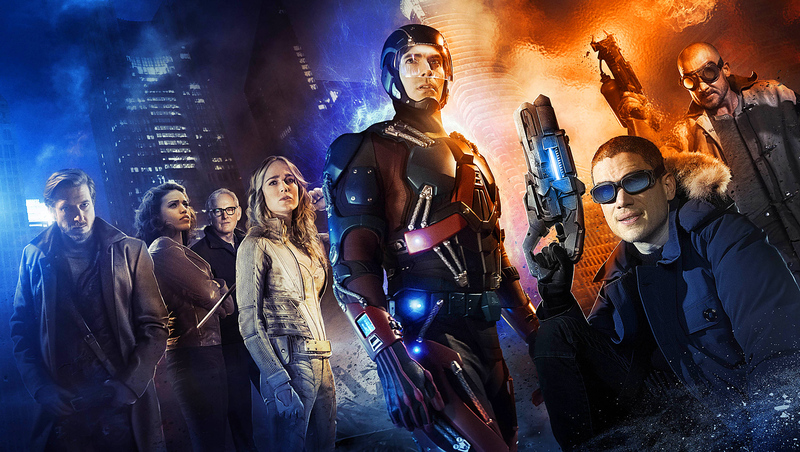 Heroes and villains join forces to become DC’s Legends of Tomorrow, beginning January 21 on The CW! Who needs the Justice League when you have DC's Legends of Tomorrow time-traveling to stop the villainous immortal dictator Vandal Savage from conquering the planet. That's the premise behind the Arrow/The Flash spin-off premiering January 21 on the CW. The new trailer is every bit as epic as the description implies. The movie-quality preview introduces us to Rip Hunter (Arthur Darvill) as he assembles this rag-tag group of heroes and villains to help him travel back in time to fend off Savage from gaining power. The Atom (Brandon Routh), Firestorm (Victor Garber and Franz Drameh), Hawkgirl (Ciara Renee), Hawkman (Falk Hentschel), White Canary (Caity Lotz), Captain Cold (Wentworth Miller), and Heat Wave (Dominic Purcell) rumble through the trailer fighting, flying, shrinking, blasting and flame-throwing. Hunter's exposition includes the line, "I've seen Men of Steel die and Dark Knights fall, " which could mean Superman and Batman obviously. If the writers aren't trolling this would be the first time those two have been referenced in the CW universe. However, if they are they could simply play it off as actual knights in armor from medieval times considering Rip is a time traveler. Other cool stuff seen in the action-packed trailer is Ray Palmer as the Atom exploding from tiny to regular size while deflecting bullets and beating up the bad guys. Also, we get a look at Firestorm's new suit that reflects the colors of the classic suit from the comics. Hawkgirl and Hawkman are featured heavily with wings fully extended, flying and arguing apparently. Sara Lance as the White Canary fighting side-by-side with a giddy Heat Wave is especially fun. January 21 can't come soon enough. On Thursday January 21, The CW kicks off a new night of action and adventure with the highly-anticipated series premiere of DC’S LEGENDS OF TOMORROW (8:00-9:00pm ET/PT)followed by the return of the critically-acclaimed post-apocalyptic drama THE 100 (9:00-10:00pm ET/PT). In DC’S LEGENDS OF TOMORROW, when heroes alone are not enough… the world needs legends. Having seen the future, one he will desperately try to prevent from happening, time-traveling rogue Rip Hunter is tasked with assembling a disparate group of both heroes and villains to confront an unstoppable threat — one in which not only the planet is at stake, but all of time itself. Can this ragtag team defeat an immortal threat unlike anything they have ever known?